All-natural, organic, hand-decorated doggie cakes for your pup's special occasion! I now live in the Seattle area but used to bake doggie cakes and treats for Bella & Daisy's, a dog bakery and boutique on Union Street in San Francisco. The cakes are made with all-natural and organic (whenever possible) ingredients purchased at Whole Foods. The cakes are not yet available for shipping, but I am working on making this an option as soon as possible! Rescue yorkie-pomeranian dog Rusty and his mom now live in Seattle and help foster dogs for Compassioned Animal Rescue and Education. Rusty is a pretty special little rescue dog who will celebrate his 14th (we think) birthday in 2012. He has no hair (most of the loss was due to abuse from his first owners, but the rest is loss from age, so he hardly has any left), so he wears little sweaters all year round. He is blind as well as losing his hearing and sense of smell, so we take it easy most of the time now, but he still loves being carried around and taking trips in the car! We used to live in San Francisco, where we got to know lots of dogs as assistant organizers of the San Francisco Yorkie Meetup. 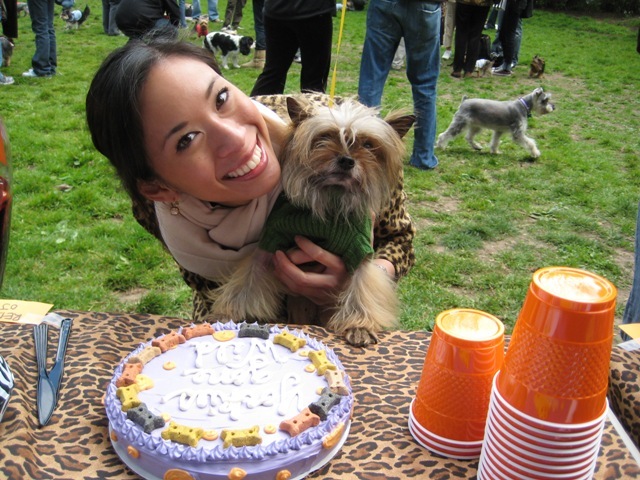 We love baking doggie cakes and treats to help our fellow meetup members celebrate their dogs' special occasions! We've also baked cakes for Rusty's mom's "day-job" coworkers and their dogs as well as for fundraiser bake sales for the SF AIDSWalk. Rusty loves the smell of baking doggie cakes but is always bummed out when his mom doesn't let him eat the cakes because they are for some other dog! But he's pretty forgiving as long as his mom snuggles with him at bedtime. Copyright Caroline's Barkery. All rights reserved.